(Ottawa, Ont.) 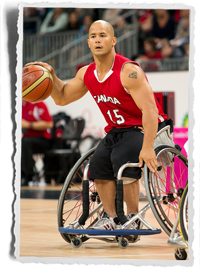 Canadian wheelchair basketball stars Patrick Anderson and David Eng will compete in the National Wheelchair Basketball Association (NWBA) All-Star Game on February 13, 2014 in New Orleans, La. Anderson, a native of Fergus, Ont., will represent the Toronto Raptors while Eng, of Montreal, Que., will suit up on behalf of the New York Rolling Knicks. Both will play for the eastern all-star team. The 2014 NWBA All-Star Game will take place at the New Orleans Ernest N. Morial Convention Center with opening tip off set for 7 p.m. CT. The event is a precursor to the NBA All-Star weekend festivities. A three-time Paralympic gold medallist, Anderson is widely considered one of the top wheelchair basketball players of all-time. Eng is a two-time Paralympic gold medallist and a current member of the Canadian Senior Men’s National Team. Both players led Team Canada to its third gold medal and fourth consecutive podium finish at the last Paralympic Summer Games in London in 2012. The National Wheelchair Basketball Association (NWBA) is comprised of over 200 basketball teams across twenty-two conferences and seven divisions. The NWBA was founded in 1948, and today consists of men’s, women’s, intercollegiate, and youth teams throughout the United States of America and Canada.